We woke up and the wind was really blowing hard coming from the East. We took off around 7:30 am. We decided to blow off any further sightseeing on Guana Cay and began to head back south to Man of War Cay. We sailed with two reefs in the mainsail. There were large swells and we had to secure everything down below. It was a very exciting sail. We had run out of water in the kitchen the night before, fortunately just after washing the last dish. Our boat had three 20 gallon water tanks – one for the kitchen, one for the bathroom and one auxiliary tank which could service either of those areas. It was a learning experience and took us a little while, but soon we were connected to the auxiliary tank. We also had a spare 5 gallon water jug which Stephen emptied into the port side (kitchen) tank. We ultimately had more water than we needed to get us back to our home port in Hope Town. This would be our last night on the Moon Doggy. We arrived at our destination (Man of War Cay) around noon. The high winds made mooring very difficult. The mooring balls were very close to each other making it very stressful in the windy conditions. It took many tries before we successfully hooked a mooring ball. There were some very scary moments with the boats being so close together. We breathed a sigh of relief when the ordeal was finally over. 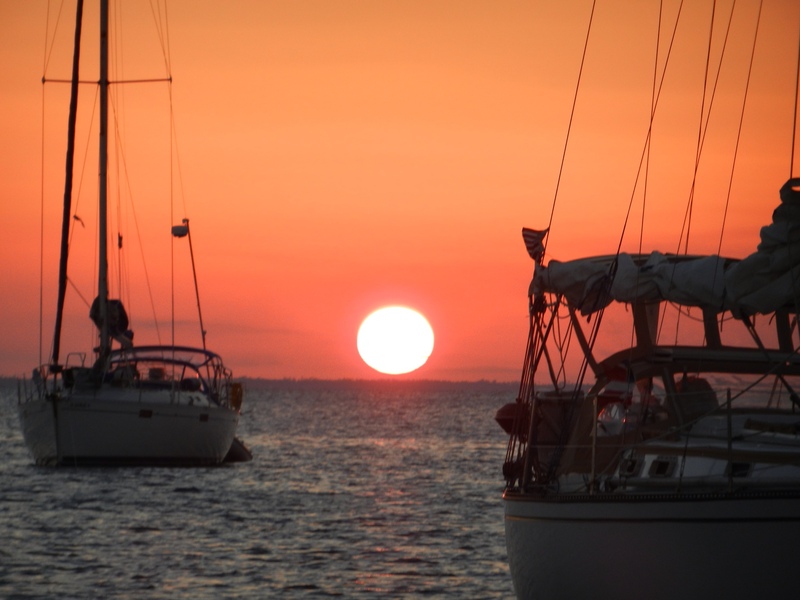 We found ourselves moored next to the same boat that had been next to us in Fisher Bay on Guana Cay the night before. The folks from that boat, recognizing us as well, came over in their dinghy and introduced themselves. 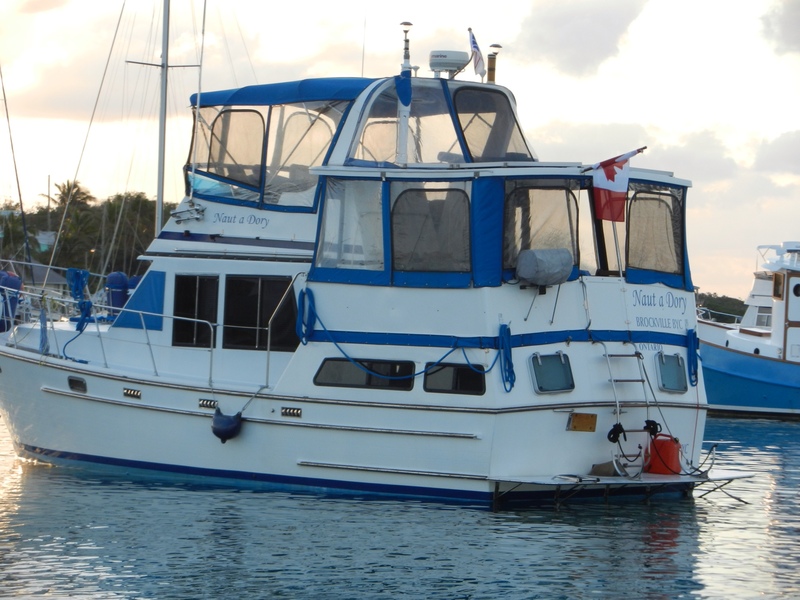 They were from Ontario and had left their boat in the Bahamas for the last year. 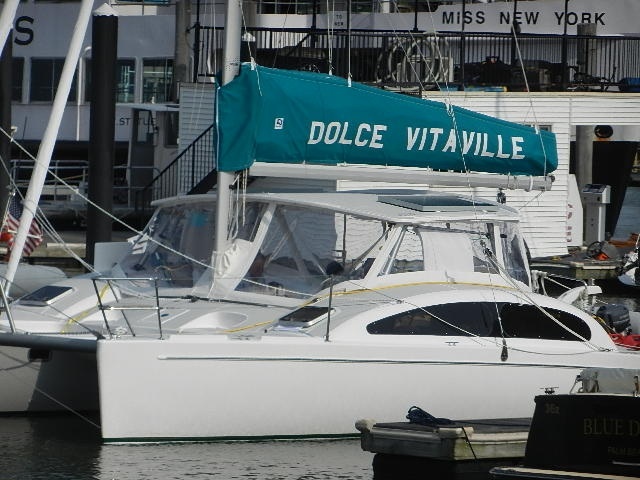 They are planning to take the boat back to Ontario via the Intercoastal Waterway in May. That will be the same time that we will be bringing our boat from Maine to Texas. I suppose we could run into each other again. We exchanged email addresses and telephone numbers. We climbed into our dinghy and went ashore for hot showers and a little shopping. It was truly wonderful to have an unlimited hot shower again. Showers, by the way, are available at various marinas throughout the Abacos for $5.00 a shower, well worth the price. This was our first real shower since leaving Hope Town last Thursday. We had made sure to take a good shower in Hope Town before we took off on our adventure. 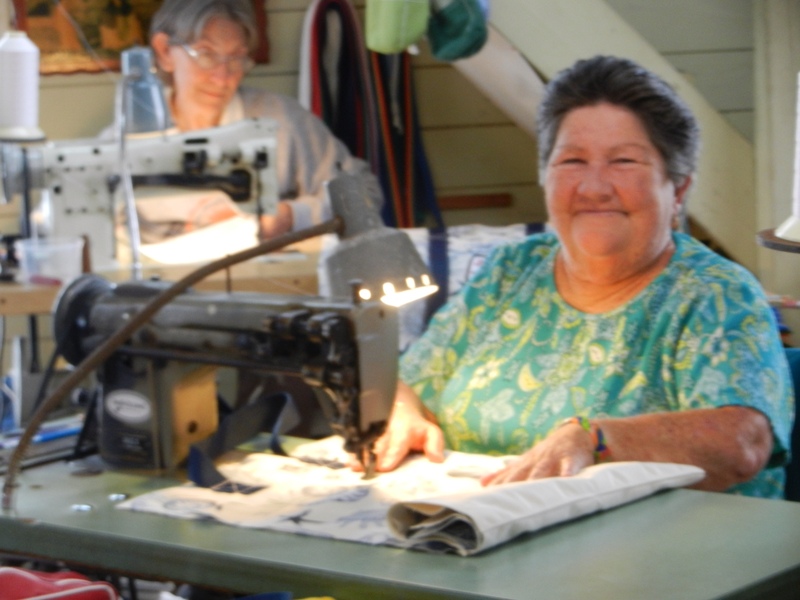 Man of War Cay is a charming community with lots of boat builders, carpenters, canvas bag makers and other artisans. We bought ditty bags for our kids and others. My folks gave me one of these bags about 20 years ago and I still use it and love it to this day. It is perhaps my favorite of all the gifts they ever gave me. It was charming to meet these ladies who hand sew these canvas items everyday. We were not able to get wifi there and we found ourselves getting further behind on our blogging and email. We were going to have to turn in the boat the next morning back in Hope Town. Sigh! Franci made a pretty nice video tour if the boat that evening. 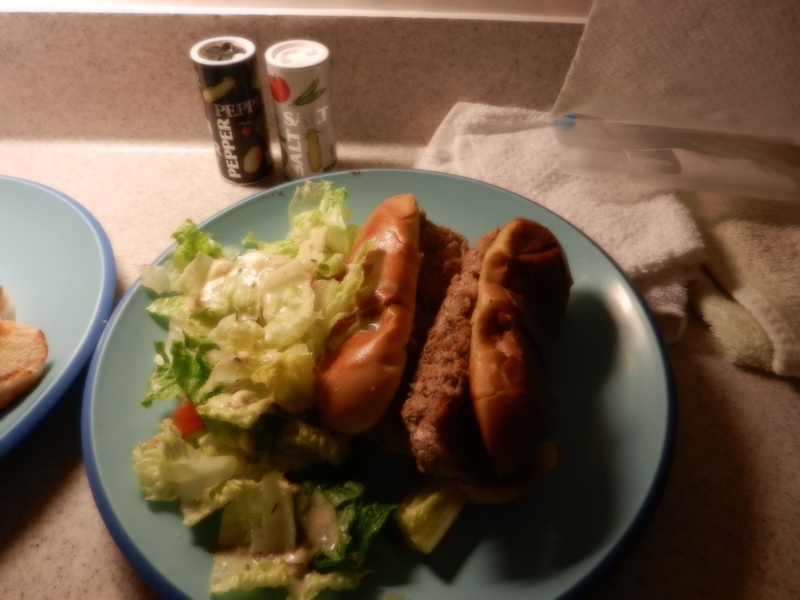 For dinner that evening we had turkey burgers served on hot dog buns and a wonderful green salad. Sunset in the harbour that evening was beautiful.